We had a tough time trying to chose what lost classic we wanted to do from The Kinks. After much deliberation it was decided to just go with our favorite Celluloid Heroes, which was the second single off of there 10th album “Everybody’s in Show Biz”. 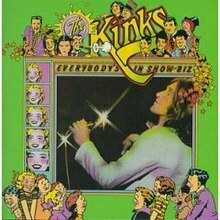 For fans of The Kinks when you are asked what’re favorite songs are by them Celluloid Heroes is usually at the top of the list. Written by Ray Davies, Celluloid Heroes is around the 6 minute mark, much longer then most songs written by Davies. You can find different versions of the song from the single to live versions that have a wide variety of times on them but our favorite version is off of the live record One For The Road, with a run time of 7:22. So for your listening pleasure this week we bring you Ray Davies on guitar, his brother Dave Davies on the lead, Mick Avory drums, Jim Rodford bass and on keyboards Ian Gibbons. This entry was posted in Celluloid Heroes, Classic Rock, Forgotten Rock Classics, Forgotten Songs, Music, Rock Band, The Kinks and tagged Celluloid Heroes, Classic Rock, CS5711, Forgotten Rock Classics, Forgotten Songs, Music, Record, Rock Music, Song, The Kinks. Bookmark the permalink.